Sealcoating is a coating that is applied to asphalt pavement to seal it against damage — which is where the product gets its name. It is applied as a liquid that quickly dries to a hard, tough film. Sealcoating offers the following benefits.• Sealcoating shields the pavement from the sun’s radiation. Just as UV rays can cause skin to age prematurely, they can also age asphalt pavement. They drain asphalt of its natural moisture, making it brittle or crumbly. • If you allow cars or trucks onto your asphalt, you will inevitably have one or more that leak fluids or fuel. These products can damage asphalt pavement, but sealcoating slows down the rate at which they can penetrate to the asphalt. • Sealcoating cannot repair major cracks, but it can cover up tiny imperfections to give the pavement a smoother look. As an additional cosmetic benefit, sealcoating can enhance the deep, rich color of the asphalt and may help restore color to faded pavement. • Sealcoating is the least expensive but most important maintenance procedure available. It can prolong the pavement’s life by many years when sealcoating is performed as part of a maintenance program that includes crack-filling. Although sealcoating is not permanent, reapplying it as needed is still much more cost-effective than repairing or replacing damaged pavement. Asphalt paving is a repair procedure rather than preventive maintenance. 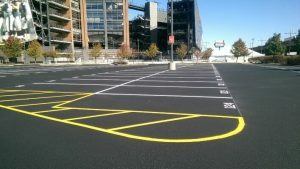 It involves the application of new asphalt, normally using one of two techniques.• An asphalt overlay is a layer of fresh asphalt that is installed over existing pavement. It is sometimes used as a short-term fix for pavement that is nearing the end of its useful life. It should not be used over pavement that has a weakened or destabilized foundation. It is also not recommended for pavement that is severely cracked or potholed as the damaged areas will begin to show through quickly, usually within 18 to 24 months if not sooner. • When asphalt is badly cracked or the foundation has become destabilized, the normal remedy is to remove the damaged area, repair the foundation if needed and then install fresh asphalt pavement. Asphalt Pavement Solutions has been providing an extensive range of asphalt-related services for more than 30 years. We offer our services to customers throughout the states of Pennsylvania, Delaware and New Jersey. 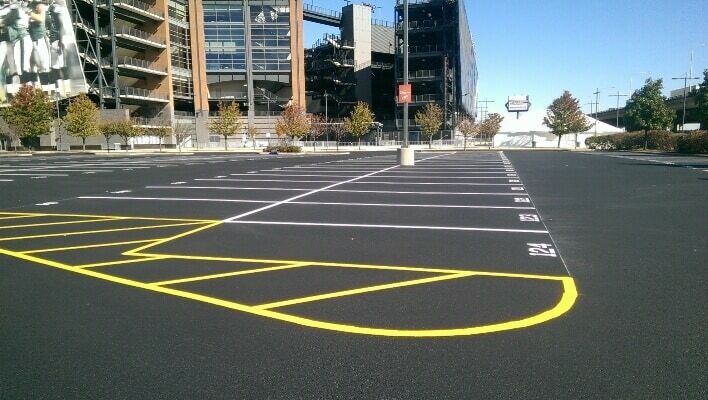 Whether you need sealcoating, asphalt paving, crack repairs, parking lot striping or any other asphalt service, our crews have the training and experience to deliver exceptional results at competitive rates. Request a free quote by using our online form, or, if you prefer, give us a call at 1.856.461.1710 or toll-free at 1.800.559.SEAL.